Note: Copy received in a goodie bag at RT16. 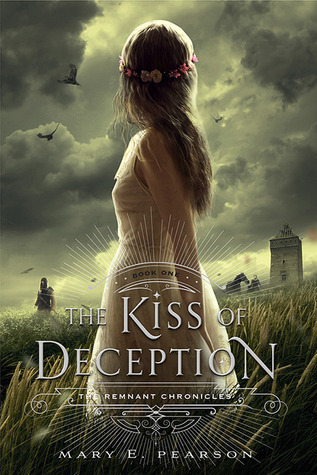 The Kiss of Deception has been on my radar for a long time. I saw it on favorites lists of many bloggers that I tend to share taste with but neither the blurb or cover was winning me over. When I saw that a group of said bloggers was doing a read-along this summer I thought it was the perfect time to give it a shot. When I saw the page count I was daunted but soldiered into it and it wound up being so well paced that even though it is a long book, it never felt slow. The one issue that held me back from quite falling in love with the book was that I never felt connected to any of the characters. I can't put my finger on why I felt like I was at arms length but it may have been the first person narration that alternated between characters. The way the characters spoke felt very focused on the what happened and not often on how they felt about it and those involved. Otherwise it's pretty standard fantasy and there were hints that made me think it's set in our world very far in the future (ie. mention of ribbed flagons left by the ancients that haven't degraded). Overall, an engrossing read with a very enjoyable blend of fantasy and romantic elements. If you enjoy those I think you'll like it.